In many fundamentalist churches there is a phenomenon known as “Favorites Night” which is code for “the pastor is taking the night off.” The bulk of these services consist of church members chortling in sadistic glee as they search the hymnbook for obscure songs in hopes of making the pianist lose her sanctification. 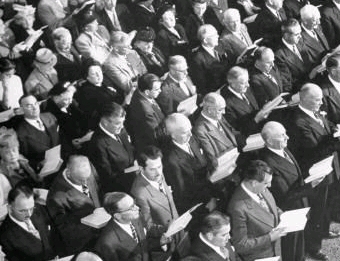 In aid of this noble goal of torturing the accompanist, the well-versed fundamentalists can consult the handy Index of Songs By Meter found in the back of the hymnal and select something like “What Hath the Lord Done for Thee?” in 7/12 meter. Pianists love it when people do that. They laugh and laugh. Throw in a few minutes of Testimony Time and the pastor can rest easy until next week. Men on the First, Ladies on the Second, and All together on the last! Call me crazy but I still love this stuff. (This one is actually done by Altar Of Praise Chorale , a Mennonite acapella group). Here’s a page from an old hymnal showing the favorite songs of various fundamentalist heroes. Click on the picture to embiggen. Many thanks to Eric for the scan. According to unnoficial fundamentalist dogma, the height of perfection in hymn writing was reached somewhere around 1947 and any music written after that point is automatically suspect. Fundies view CCM artists as tools of Satan to tempt young people to turn the fellowship hall into a dance hall. CCM artists view fundamentalists as the musical equivilant of Elmer Fudd. 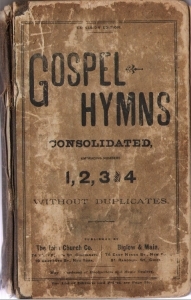 As the official collection of approved hymns has been canonized, however, there have crept in some strangeÂ selections that can only be described as “absolutely awful.” These would include songs about honey coming out of rocks, boys wandering around, little brown churches in the valley, and holding a fort. It can only assumed that these hymns were included because they were written by the General Editor’s brother-in-law or perhaps someone to whom he owed great sums of money.